After a long and almost unbearable wait Game of Thrones has finally returned to TV. Here are afterthoughts of the most recent episode Queen's Justice. If you didn't see Season 7 Episode 3, you will most likely be spoiled by this article. Jon Snow and Davos Seaworth reach Dragonstone where they are in route to meet up with Daenerys. They are met on the beach by Tyrion and Missande. They are forced to surrender their weapons. Their boat is also taken as well. They begin their long walk to meet Daenerys in the castle. The first meeting of Fire and Ice doesn't quite go the way most would have thought. Daenerys is as arrogant as ever and Jon is well Jon. Daenerys wants Jon to bend the knee and Jon isn't interested in doing battle with the south. He know the real threat is to the north. Their first meeting is actually pretty funny as Daenerys get fustraited with Jons stubbornness quickly. Varys breaks up the meeting and tells Daenerys that the Greyjoy Fleet was destroyed almost everyone was wither captured or killed. Euron delivers the last of the the Sand-Snakes to Cersei and Takes Yara for himself..
Cersei plans on torturing Ellaria Sand by poisoning her daughter and having her watch her die of poison. Tyrion plays match maker of sorts and goes to ask Daenerys if Jon snow can start mining Dragonglass. 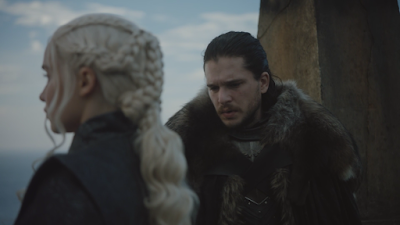 Jon and Daenerys have a second meeting. Goes a lot better than the first. Sansa is overseeing the the preparations at Winterfell where she receives a unexpected visitor. Her Brother Bran. 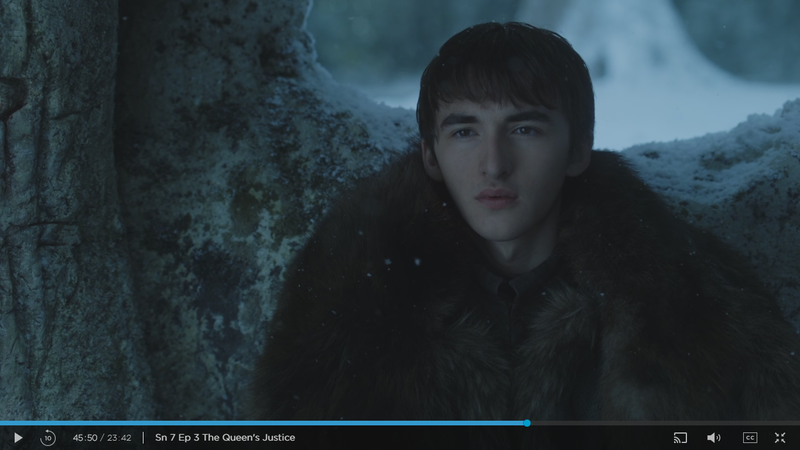 Bran tries to explain that he is the new 3 eyed raven to her. His powers start to freak her out when he tell her that she looked beautiful the night of her Wedding at Winterfell to Ramsey Bolton (one of Sansa's worst experiences). I read a theory that Bran is actually the Night King from a different time line and now I cant un-see the similarities in facial structure. The Unsullied take Castery Rock easily but the Lanisters led by Jamie take High Garden. Oleena Tyrel has one final squabble with Jamie and tell him to tell Cersei it was Me (Refers to killing Joffery). I'm so loving this season it a shame that there is only 4 more episodes this season. Cersei is a monster, there is no denying it. Jon and Daenerys are enjoyable to watch on screen. Euron Greyjoy is hilarious and he needs more scenes time lol. Can't wait to see what happens tonight. I already have a good idea due to the leaks but there is nothing like watching the episodes unfold.